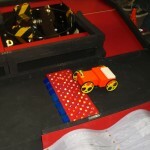 Liz: a bunch of the Pi Towers crew spent Saturday at Pi Wars, the amazing, community-run Raspberry Pi robot competition, now in its second year. 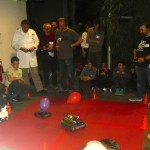 With 500 attendees and more robots than we’ve ever seen in once place before, the event’s really come into its own. 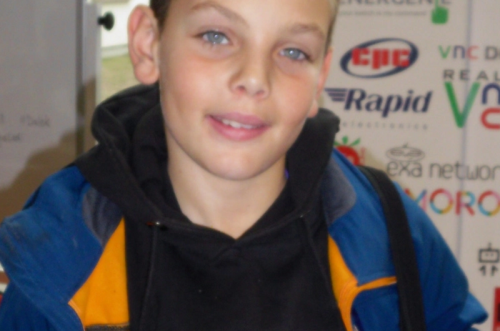 I was going to blog about it today, but late last night, I came across a blog post from one of the young people who took part, and decided he did a much better job that I could have done. 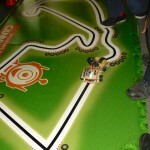 So here’s 10-year-old Femi’s beautifully written post, which includes a ton of video interviews with robot makers: you can see more of his work on his own website, hackerfemo.com. Thanks Femi, ENORMOUS thanks to Mike and Tim for organising the event, and thanks to everybody who came! 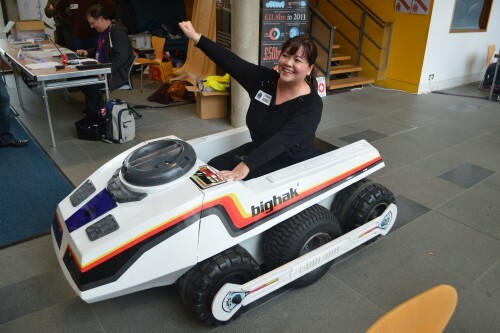 Liz driving Hitchin Hackspace’s BigHak, last seen heading for the A14. What an amazing weekend! Very early Saturday morning me and my mum headed for Cambridge to witness the wonders of Pi Wars – run by CamJam organisers Mike and Tim. Femi, author of today’s post. After getting a goodie bag and our Judge and Jam Maker stickers we went to explore the amazing robots that were competing against each other. There were around 30 competitors. I managed to interview five of them: Darth Cthulhu, The Bomb Squad, Optimus Pi, Triangular and Revenge of the PyroBot, along with young robot fanatic Crazy Squeak’s own robot that he brought along to test out on the challenges. 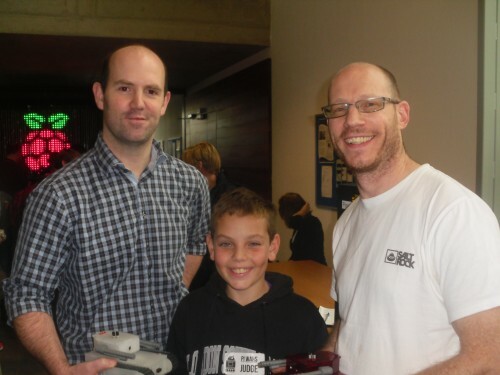 Crazy Squeak – it was really great to meet you at Pi Wars and look forward to reading your blogs too. 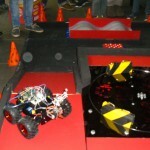 The Bomb Squad: Yasmin Bey talks about her small but deadly robot. Amazing 10yr old coder and robot inventor talks about testing his robot out on the challenges at Pi Wars. It was a great privilege to judge the Three Point Turn challenge with my mum and JarJarGeek. He is an amazing blogger and we had a lot of fun working together as a team. He took some video of the event. It was really interesting as the robots have to do this challenge autonomously: some used sensors but others used measurements or adjusted the number of wheel rotations/angles etc. 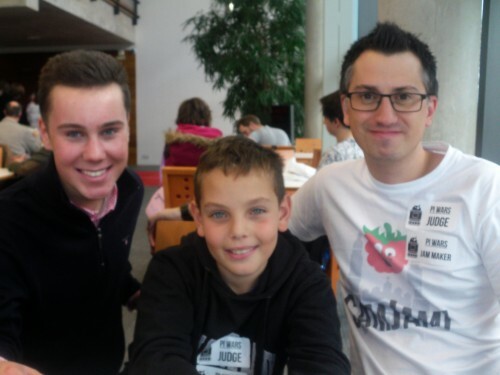 I also met two other very cool bloggers called Matt – Raspberry Pi IV Beginners and Raspberry Pi Guy – also Matt. They gave me some great advice, and their recording equipment made me realise that if I want to get serious, as a blogger, poor mum will have to help me raise some funds! One of the real highlights was interviewing Raspberry Pi’s founder and CEO (Trading) Eben Upton, who said that the Raspberry Pi is all about helping young people to explore coding. He also talked about the £4 Pi Zero and enjoying Pi Wars. In fact there were so many cool people around. I even got to speak to the other CEO of Raspberry Pi, Philip Colligan, who said that he’d really enjoyed reading my blog and that it was ‘amazing’. Wow – that has made me very happy and it does help me to keep going – even when it gets so busy with other stuff! My favourite robot was the Revenge of PyroBot – it was so cool – with creator, Brain, putting his old robot on top of it. He said it had got trashed last year and this year he’s out for revenge – bigger and better than ever. It was true – he won about 6 prizes. 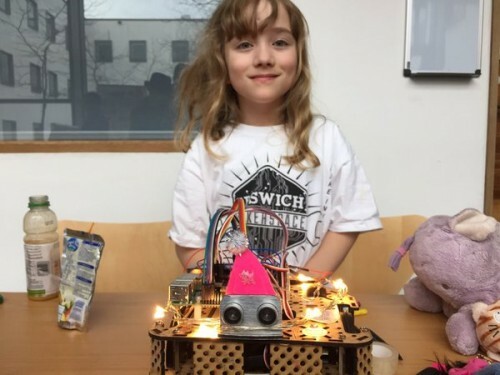 We are having a Robot hack next week at our South London Raspberry Jam, so coming to Pi Wars was really inspiring and we got lots of encouragement from the community, at the event. Thank you to RyanTeck, Pimoroni, Ragworm, and RapidOneline for helping us out. I am also grateful to PiBorg, Ryan Teck (SnowPi) and Mearm for agreeing to send me products to review on this blog. Amy Willis and her show-and-tell robot, Huggles: Amy did all the soldering herself. So this week, we have a CamJam Robot kit that I’m going to be building and mum’s going to ask the IT department at work to do a 3D print of the chassis – see Daniel Ball’s thingiverse.com website. 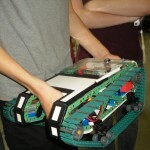 We’ll use it as an example for the young coders at our event to build, code and compete in our very own mini Pi Wars. Last thing! I want to read something awesome over Christmas – can you recommend an iconic or essential piece of writing for a new coder and future designer/builder of robots and the gadgets (Internet of Things) – bearing in mind I’ve just turned 10? It can be anything – article, fiction, non-fiction or comic. Leave your suggestion in the comments, please? 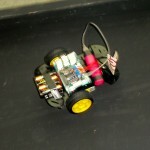 Looks like fun :) i’ll have to get along to the next installation of PIWARS! I started computing at your age, but that was 35 years ago and computers have changed incredibly since then. One story that you might enjoy reading, especially since we now have Pis in space, is about the guidance computer for the Apollo missions (https://en.wikipedia.org/wiki/Apollo_Guidance_Computer). The team that designed the software, led by Margaret Hamilton, achieved amazing results with very, very limited resources – I find it inspiring and humbling. Thanks for the amazing comment, the words are all mine but my mum edits it so it’s not so stressful every Sunday evening when I write the blog. Liz doesn’t need to worry, she just needs a mum to proofread her work – it very nice – thanks mum! Don’t be surprised at the abilities of the young people who are interested in RPi. 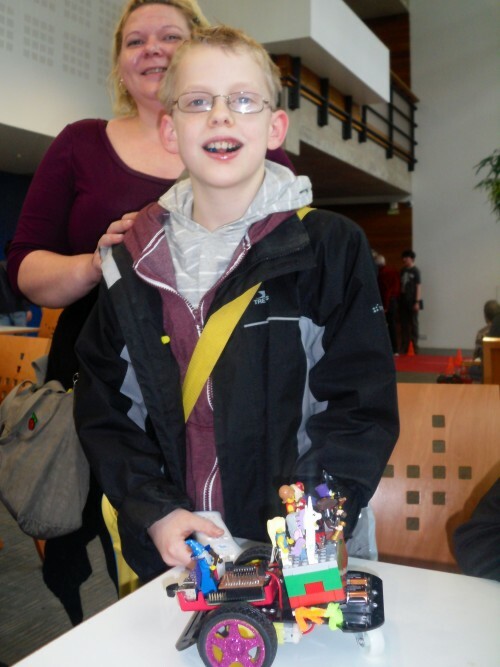 We took part in the Show and Tell where our Lego based robot attracted the attention of mainly the younger attendees and where we deliberately encouraged them to take control of it themselves. We also took the time to talk to them about their RPi experiences. We were gobsmacked by the level of understanding some of these young people had and also by what they had been able to achieve on their pocket money/paper round resources. 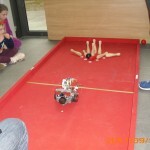 Even more amazing were those who had joined with friends to make their robots with little/no parental input. The quality of some of the questions they asked was phenomenal. 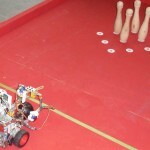 Before going to PiWars we had imagined that all these robots would be Geek Parent Projects with the kids tagging along. Refreshingly, more often than not I found the reverse to be the case. I just don’t know how they do it but I think I need to re-watch the 1960 movie called The Village of The Damned just in case there’s something sinister going on that I’ve missed. 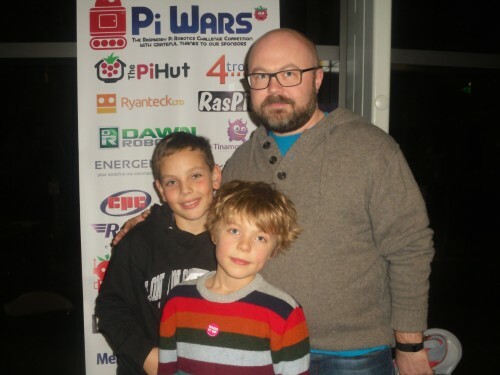 I was honoured to meet young Femi at Pi Wars and I am delighted to see the picture with Femi, Matt Manning and I! Yeah was great to meet you 2. Top Family!!! Another awesome blog by Femi. 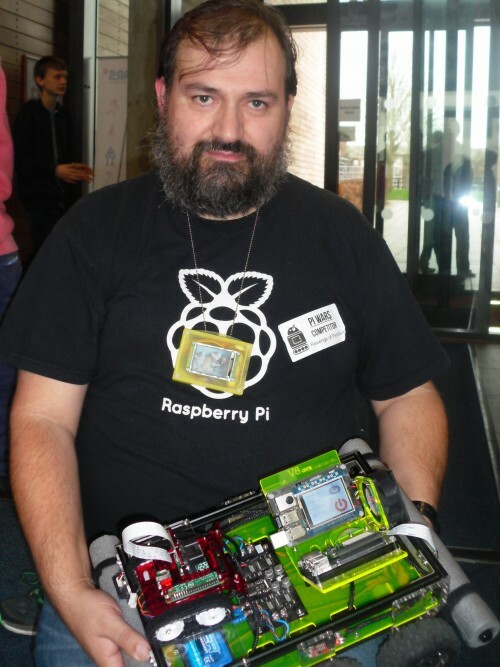 Congratulations on being featured on the Raspberry Pi blog and thanks for interviewing the Southend Raspberry Jam team. Thanks to Mike and Tim and everyone who made it a really great day. We came second on the straight line speed test and reached the semi-finals of the Pi Noon “balloon pop” challenge. After seeing all the amazing robots on Twitter and blogs, I still can’t quite believe it. Now you can all see, in great detail, our MacGyver style robot which uses a PotNoodle pot and lots of Blutack. “The wheels fall off, sometimes” – shh, don’t tell them ALL our features. Thank you Liz, Eben and Philip for taking the time to talk to our team members. We’re all feeling really inspired, if not a little exhausted. What an amazing write-up Femi, it was great catching up with you on Saturday! Thanks to Mike, Tim and all the volunteers for a fabulous day! Great work Femi, keep at it! “The soul of a new machine”, written by Tracy Kidder. Inevitably the machine, the computer being built, has long since passed into history. The writing and the insights might still be engaging. Check out some reviews on ‘goodreads’, see what you think. Nice one, Femi. Well-written and some lovely interview footage. Great job! Well done, Femi – that was a very interesting, informative and well illustrated write-up. I wish I could have been there. I haven’t come across your blog, but I shall make a point of checking it out now. I suspect you have a bright future ahead of you: congratulations to you (and your mum!) on a job well done. Thanks Femi for a great write-up, which captured the excitement and general awesomeness of the day. When people ask “what exactly were you doing on Saturday?”, I’ll point them at your write-up. – for “iconic” have a look at one of the talks given by Bret Victor e.g. “Inventing on principle” https://www.youtube.com/watch?v=EGqwXt90ZqA Fast forward through any bits which you don’t find interesting. OK its not a book, sorry. Nice one Femi :-) It was great to see you at PiWars. Femi, if you want new recording equipment get your mum to start a crowdfunding campaign. I’d definitely chuck in something as you’ve really got a talent for it, and I’m sure others would too. As for what to read…eekk…hard to say at 10. I read Hacker – Malorie Blackman around that age I guess – pretty good fiction about white hat hacking for kids! It’s hard to say on non fiction because most of the stuff I read is on software engineering which’ll be probably at your level in about 4 years judging on how much further on than me you are when I was your age! Good job on the post Femi! I really enjoyed reading it! Happy Hacking! The second annual Pi Wars - apply now!